Wyn opened her eyes and looked up at the window where the morning sunlight was automatically shaded to prevent glare but still looked warm and pleasant. She stretched herself happily. Beside her, Jamie was still asleep. She kissed her lover’s cheek and got up out of the bed. K9 whirred quietly into ‘wake mode’ and greeted her with ‘good morning mistress’ as he hovered along beside her, knowing her routine by now. She pressed the button on the automatic dispenser and a hot cup of coffee materialised in the slot. She sat on the window seat with K9 by her feet as she drank the coffee and looked out over 51st century London. Most of it great skyscrapers of steel and glass that looked like giant harmonicas. They were living on the 102nd floor of one in what was still called Canary Wharf. Below, the Thames flowed along that u-shaped loop so familiar to people who watched Eastenders in her day. But now it had a glass roof over it from Tower Bridge to the Thames Barrier. There were still some historical sites. Trafalgar Square hadn’t changed much. Buckingham Palace was a luxury hotel and restaurant. The Houses of Parliament were a museum. 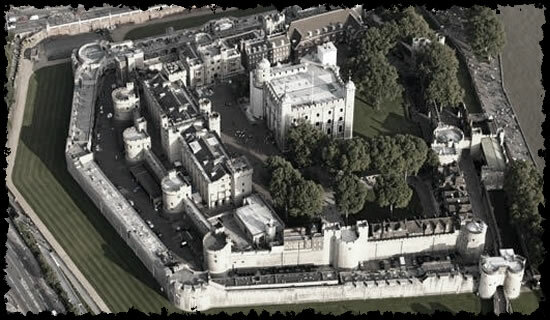 The Tower of London was still open to the public, although there was a modern undercroft beneath the ancient dungeons that was the headquarters of the Time Agency. Of course, in HER day some of that was already there. It was the Headquarters of U.N.I.T., the military organisation her mum and The Doctor used to work for. But now it wasn’t a secret at all. The Time Agency were almost a tourist attraction in their own right, with their public gallery where they displayed artefacts and exhibitions of the most notorious cases of temporal crime that they had thwarted. The fifty-first century! It was amazing to think that planet Earth survived that long. In her time the odds didn’t look so good. Between raging political issues and the environmental damage humans had inflicted, she found it hard to believe her own generation lived to tell the tale. But they did. Humans made it. Earth was ok. It was a beautiful, shining place that billions called home, and billions more who lived on colony planets nostalgically called ‘homeworld’ and visited on their holidays, bringing their colony born children to revisit their roots. And she had been a citizen of it for nearly three months now. The happiest three months she had known for a long time. Not because she was on Earth in the 51st century, but because she was on it with Jamie. It won’t last, she told herself. It’s not supposed to last. Jamie’s people don’t do true love forever. They do true love for a few months and then move on. She knew that, but she didn’t let it spoil the fact that here and now Jamie loved her and they were having a wonderful time. She had achieved something that she was sure even Time Lords couldn’t. She had learnt to live in the present, in the moment that was, to enjoy every minute of it and not be dwelling on the past or worrying about the future. Jamie stirred in the bed. She was one of those people who woke up all at once, not a gradual one. “Good morning, Mistress Jamie,” K9 intoned. “Good morning, K9,” Jamie answered as she pulled on a silk kimono gown and slipped out of the bed. She, too, went to the food dispenser for coffee and then joined Wyn at the window, sitting behind her as Wyn leaned her head back against her shoulder. Once the coffee was drunk she embraced her lover around the waist and kissed her neck fondly. “A beautiful morning,” Jamie commented as they enjoyed that simply intimacy. She looked at Jamie’s reflection in the window, a handsome man instead of a beautiful woman, masculine arms around her instead of the feminine ones. She adored Jamie in either form, because they were both Jamie. She didn’t mind that she hugged her this way every morning. Changing to male form was the equivalent of putting on a suit for work. The male Jamie worked, the female Jamie played. The female Jamie was her lover. The male Jamie was her loving friend. “I may also be of assistance,” K9 reminded them. “I have never chased cats,” K9 answered. Jamie always teased him with things like that and he never got the joke. “Don’t interface with any strange computers either,” Wyn told him with a laugh. She took the two coffee cups that had been sitting on the windowsill and put them in the recycling receptacle under the food dispenser. They were automatically turned to their component atoms and stored ready to be reconstituted as clean cups with the beverage of choice later. It beat washing up, though Wyn was still dubious about an atomising device in the corner of the bedroom. Jamie had assured her several times that there were no known cases of injury or death from a domestic recycling machine but it still seemed a BIT odd. Showering was still a normal activity and they both kept clothes in an ordinary wardrobe, although Jamie’s side of it DID include the Empathy Suit that changed according to his/her choice of gender and style. He wore an ordinary suit today. Wyn chose a pale blue skirt and blouse and a black cloak and beret which were fashionable this year and which she rather liked. She headed for the elevator with Jamie, K9 at their side, and they travelled the twenty remaining floors to the rooftop skyke park. At the door, Wyn stopped and inserted a credit disc into a dispenser and took what looked like two mint imperial sweets from the receptacle. She chewed them slowly as she walked with Jamie to her personal skyke. Skyke was a generic word for the most common form of transport in the 51st century, used the way Wyn used the word ‘car’. They looked like a jet plane and a car had mated and produced hybrid young. Jamie’s one had sporty looking delta wings and was a cool metallic dark green. It had a concealed siren and flashing lights in case he was in a hot pursuit but mostly he preferred to be ‘undercover’. Once up into the speed lanes where London really DID look like the map from Eastenders they accelerated. It was only minutes before they reached the coast, following the Thames through the Home Counties. Purely for Wyn’s pleasure, they flew down the English Channel, between Dover and Calais, then hugged the French coast as they rounded Brittany and cut across the Bay of Biscay to the Iberian peninsula, past Portugal, through the Straits of Gibralta and into the Mediterranean. They kept close to the Spanish coast, finally descending into the skyke park in the Placa Reial in the heart of Barcelona. The city, not the planet, Wyn reminded herself. She had once visited a planet by the same name which made The Doctor laugh at a joke he never seemed to want to share with her. On the whole she thought the city looked nicer. The historic part of it was even more well preserved than London and if it wasn’t for the skyke lanes in the sky she might forget that she was in the fifty-first century. Not having cars running around the streets, mind you, made it a much safer city, though it was still busy. People who had more than a short distance to walk used three wheeled scooters with gravity wheels. You stood on them, holding the handle to steer while the wheels turned using built in miniature gravity forces. A gravtrike built for two was a romantic way to see Barcelona, but they were on business so they rode individual ones. K9 hovered beside them, keeping up with the pace. They went up the steps towards what ought to have been a place of peace and tranquil contemplation. Instead there was uproar. The source of the noise was a small group of people under the grand gothic arched entrance that the local police were trying – unsuccessfully - to calm down. Two of them seemed to be priests in medieval style habits. That was Wyn’s best guess anyway. They put her in mind of Friar Tuck. They were speaking in a mixture of Latin and Spanish. There was a nun in the sort of really stiff wimple that looked as if it could fly on its own who looked utterly terrified and was on her knees, praying in French, her rosary beads clattering as her hands trembled, and a pair of almost laughably stereotypical American tourists, fat, middle aged wearing Hawaiian shirts nearly as loud as the man’s voice as he demanded to speak to the US consulate. Actually, the sight of K9 was scaring her more than anything. He backed off discreetly as Wyn knelt down and spoke to the nun in French. She had learnt to speak French and Welsh at school, but her fluency with languages was courtesy of her time as a crewmember of the TARDIS. She was able to understand the frightened nun and to reply to her. Wyn’s skirt was below knee level. She had never had enough confidence about her thighs for anything shorter. But it must have been alarming to somebody from the 12th century, as was just about everything else about this place. They looked up as skykes flew over the plaza and crossed themselves frantically. The nun didn’t even dare look up. She kept her tearful eyes cast down, convinced that these devilish objects would go away if she didn’t look at them. Wyn stood and Jamie stepped towards the nun. She looked at him fearfully as he pressed the device against her forehead. Then she vanished. He turned and looked at the two priests. They raised wooden crucifixes and murmured loudly as he scanned them and concluded they were from 1197 and had slipped through the temporal anomaly at a quarter past twelve on the afternoon of March 13th of that year. But they wouldn’t let him come near them with the devilish device that had already made an innocent woman vanish. He reached in his other pocket for something that looked a little like a very small gun. He pointed it at the two priests and it let off a very localised and directional pulse that rendered the two men and the pair of noisy tourists unconscious before he stepped forward. He put the temporal repair device against the foreheads and sent them back to 1197. The tourists went back to the 18th of July, 2006 at 15.35. “Can’t do much for them. They’ll just wake up with severe headaches and think they’ve been mugged.” He dropped the two small devices back in his pocket and pulled out a rather larger one, the size and shape of an orange. 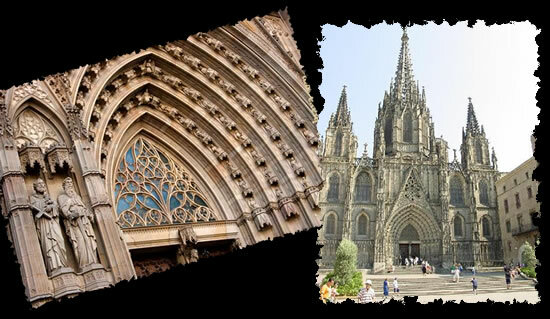 As the local police – known as the Mossos d'Esquadra - kept the fifty-first century tourists back he scanned all around the portico of the Cathedral. The device beeped loudly. “Yep,” he said after a while. There’s a minor rip in the Time Dam. Five minutes work.” He turned the device around and scanned again except this time the air shimmered and there was a low whine like an electric toothbrush. As he worked, several very puzzled looking people in contemporary clothes appeared, obviously people who had fallen through the rip from THIS time and place. One of them complained about finding himself in the middle of a bunch of men in brown robes chanting in Latin. Another had nearly got run over by a horse drawn carriage when he stepped away from a half finished Cathedral façade. Two others were still coughing from their experience of the early twentieth century air polluted by the internal combustion engine. “Sorted,” Jamie said five minutes later. “Rip repaired. Shouldn’t be any more trouble. We’ll be off.” He reached out for Wyn’s arm and they went down the steps together. A short gravtrike journey brought them back to the skyke and they took off vertically to the speed lane. By five o’clock in the evening as they left Marseilles after dealing with an anomaly there she was feeling in need of more than just travel sick pills. Not all of the time rips had been as harmless as the Barcelona one. They got one fifty first century citizen of Rome back beheaded and a World War II German soldier in Brussels had wounded several people before he could be disarmed. Jamie had heard similar stories from his colleagues who were engaged in the same work. “You said these rips happen around monuments that have been preserved using Time Dams,” Wyn said thoughtfully as they headed back over the English Channel to home at the end of Jamie’s official working day. Jamie glanced at the screen and frowned. “They’ll let little me into the inner sanctum!” Wyn was just a little sarcastic. Until now Jamie had not brought her further than the public gallery of the Time Agency. “Maybe it would be better if I looked like a woman, then.” Jamie smiled and shimmered and the shirt filled out interestingly. She shook her hair back and carried on driving. That was the closest they had come to an argument Wyn noted as the skyke landed on the roof of the Tower of London and was immediately transmatted to the underground parking garage below. “Sorry, should have warned you about that,” Jamie laughed softly as Wyn grabbed the door handle and jumped out of the skyke as soon as it stopped. She wasn’t physically sick, but she looked a worrying shade of grey-green for a few minutes. K9 looked a little dazed, too. How it was possible to tell, neither of them could say, but he DID look as if the transmat had momentarily scrambled his electronic brain. His eye light dimmed and flickered and then went off altogether for ten seconds before he rebooted and declared himself functioning normally. She grabbed Wyn’s hand and pulled her towards a turbo transporter – like a lift but not confined to up and down. Jamie gave it a voice command and it headed up and then left then up and right, towards the central command briefing room. The transporters WERE dampened for comfort and the sensation of movement and direction was no worse than in the TARDIS. Central Command Briefing Room was already crowded. Jamie and Wyn slipped in and found it to be standing room only. A stern looking man in a smart black uniform and a sort of moustache Wyn associated with black and white Battle of Britain films stood in front of a large viewscreen where images of temporal incidents flashed rapidly past their eyes. Wyn concentrated on the images in a way she had learnt to do in the TARDIS where The Doctor very often looked at things at HIS speed rather than everyone else’s. The depth of the problem facing the Time Agency was clear. Good metaphor, Wyn thought. Time bleeding through… sticking plasters. But does he have any other ideas? “Antarctica is a tourist attraction?” Wyn asked Jamie. “No, we use the Time Dams there to keep the ice cap stable,” she answered. “Sabotage?” The word went around the room like wildfire. None of the agents had considered that possibility, but now that they had, they fixed on it as the most likely reason for the increase in the time rips all across the world. But what if they were wrong? As Wyn listened to the Lieutenant outlining his plan of action, she quietly reached into Jamie’s jacket pocket and took out her mini-computer. When the fifty-first century scientists invented a mini-computer, they meant it. This was the size of a slab of post-it notes that had been almost used up. The keys were so small it used a stylus the size of a cocktail stick to press them. But otherwise it was a fully functioning computer with wireless networking taken for granted. And it told her something very interesting indeed. As the Lieutenant paused for breath and the pictures on the big viewscreen changed, Wyn put her hand up. To her annoyance her hand was ignored as the Lieutenant fielded questions from his agents about the likely nature of the terrorists responsible for the sabotage. “Who’s claimed responsibility?” one of the agents asked. And Wyn, who had come to the 51st century under the impression that Earth was a peaceful place that had sorted out its political differences was surprised by the answers. In Wyn’s mind the Sons of Pluto conjured up visions of yappy and boisterous puppies that could both lick you and wag you to death. But the mini computer automatically brought up a stream of information about a very sinister lot with some ideas about how people should live that Wyn didn’t like the look of at all. She certainly didn’t think her hips were made for a prayer robe. And she wasn’t wearing a veil whenever men were present. The Isthians on the other hand were a rather sweet looking pale yellow humanoid people who she thought had a reasonable point. If they wanted to leave the FEC – the Federation of Earth Colonies, then why shouldn’t they? “Yes, but….” Wyn began. “I don’t think…” But nobody was taking notice of her. “It doesn’t matter which group are responsible,” the Lieutenant said. “What matters is that they are stopped. You all have your assignments. Put on your twenty-four hour Wake patches and call your loved ones. We’re on overtime from now until this is sorted.” The agents all stood up, taking memory chips with their assignments on them. As the room cleared, Jamie was called back by the lieutenant. Wyn overheard some of the words and they sounded cross. Jamie’s expression when she came at last to join her at the door was best described as ‘tense’. “Are you in trouble?” Wyn asked her as they headed for the skyke park. “Oh.” Despite the gender changing Wyn tended to forget most of the time that Jamie wasn’t Human, just as she forgot that The Doctor wasn’t a lot of the time, except when he did extra-ordinary things that reminded her. But the idea that Jamie was pushed off this case BECAUSE she wasn’t from Earth was appalling. Jamie looked at her dubiously, but now she had a captive audience Wyn kept talking. “Can we get through a half hour without The Doctor coming into the conversation?” Jamie responded. Jamie looked at the screen. Wyn had called up a schematic that showed where all of the time rips had occurred across the planet. And there WAS a pattern. A radial pattern, like spokes coming off one central hub. The further away, the less frequent, but close to the centre, one city had been subjected to fifty of the rips. The city was Paris and at the centre of the time rips…. “The Eiffel Tower!” Wyn laughed triumphantly as Jamie located the position. “That’s where this starts from. “The Eiffel Tower?” Jamie gave a low whistle. “I think you’re onto something. Buckle up. We’re out of here. You’d better slap one of these on, too.” She reached into the glove compartment and pulled out a small box containing what looked like Nicorette patches. Wyn looked at Jamie questioningly as she slapped one onto her upper arm. “What’s your planet like?” Wyn asked. They were approaching the outskirts of Paris and Jamie slowed the skyke down to a little over thirty miles per hour, a mere crawl compared to what they had been doing, and dropped down to a level just above the rooftops of the city. Unlike London, fifty-first century Paris did not have many skyscrapers. Its planners tried to keep the familiar skyline unobstructed. Its inhabitants lived, rather, in a sort of reverse of a skyscraper. Two or three stories of the buildings were above ground with rooftop gardens and solar panels on the walls and as many as fifty floors of apartments were below ground, accessed by turbo lifts. People seemed to like that lifestyle. Wyn wasn’t sure she would. A couple of mis-adventures in the mines and caverns around Llanfairfach had taught her to value life above ground. From what Jamie had described of the ‘Underland’ of her world she thought SHE preferred life in the open air, too. “Readings are a moot point,” Jamie said as the Eiffel Tower came into view. She realised that she SHOULD have been able to see it for a while. It was, after all, lit up at night and could be seen prominently from almost all parts of Paris. But for the past ten minutes or so it had NOT been visible because it hadn’t been there. As they drove closer she and Wyn watched in astonishment as the tower unbuilt itself, the top levels disappearing first, then bit by bit the tower sections before it disappeared from view altogether for several minutes then built itself up again. It was like watching a video of the stages of construction, and it would have been fascinating if it were not obvious that something very terrible was going on. “Because the tower…. At the top of it… is where the Time Dams are controlled for the whole planet.” Jamie sounded REALLY worried now. “You know what we’ve got to do, don’t you?” Wyn said. Jamie looked at Wyn and was about to ask which one of them was the professional here. But after all, she was OFF duty right now. They were neither of them in charge. If Wyn had an idea how to handle this situation then she was willing to put her trust in her. She parked the skyke right at the foot of the tower and they stood there watching it. They were not alone. Many citizens of Paris had come to see what was happening to their beloved monument and the police were trying to hold them behind a cordon. There were already a few Time Agents on hand but they were doing nothing but standing around staring. “Has anyone tried to get inside?” Wyn asked. Wyn and Jamie both had the same unpleasant vision but at the same time both thought of something else. They looked at each other and then ran towards the stairs that led up one huge steel leg of the tower, K9 hovering behind them. They reached the Mezzanine level above the four supporting legs in what Jamie’s wristlet told them was the forty-fifth century. – At least at first. Wyn had a brief glimpse of tourists watching a huge plasma screen with photographs of the construction of the tower in 1889 before they were gone and other people briefly appeared and disappeared as time span backwards. The images of a partially built tower, without the part of it they wanted to reach, was unnerving. “Yes,” Jamie answered her. They headed for the lift and got in. Although their journey upwards remained constant, other passengers were appearing and disappearing as time span backwards. And Wyn noticed something about that as they progressed upwards. “We’re not going to reach the top before the top isn’t there,” Wyn said. “You’re right. Hang on. Literally hang on. Grab hold of me.” Jamie pulled back her sleeve and tapped quickly at her wristlet. Wyn gave a soft cry as the lift cage around them and the structure of the tower dissolved. She looked down as the tower rapidly receded from her, but she did not fall. She and Jamie and K9 were suspended in a stasis bubble generated by the wristlet. The tower built itself around them as they hung in stasis in the lift shaft. Wyn looked down and saw a lift coming up the shaft. As she and Jamie touched their feet down on it and K9’s hover pads connected Jamie switched off the stasis and they felt gravity claim them once more. They rode the top of the lift cage to the top of the tower, jumping off on the observation deck. For a mere moment somebody cried out in surprise but time was still marching on and they were not there long enough to be chastised for their unorthodox arrival. They were moving forward in time too fast to catch the conversations of the people who flitted in and out of view. There was a susurration of sound that was an amalgamation of their voices. But Wyn could hear something else. “Please….” came the voices again. They were soft – watery was a word that seemed to describe them. Like somebody speaking underwater, if that was possible. They were frightened and pleading. An image came unbidden into Wyn’s mind. Or perhaps the Zerite had some power to reach into her thoughts and find something familiar that would help her to empathise with their plight. It was a Human tragedy that occurred a few years before she was born, but she had seen the pictures on TV - Human beings crushed to death as more and more of them were herded into a place with no exits that was already too small for them. That was what was happening to the Zerites in the time dams. More and more of them were trapped and they were dying. A few managed to break through the rips. Another vision came to her of fish in a trawler’s net, a few escaping through holes but most hopelessly caught up together to die. It was another few minutes before they reached the time when the observation deck of the Eiffel Tower had been closed to the public and made into the central processor for the time dams that preserved all the world’s monuments. K9 immediately interfaced his nose probe with the computer. “Estimate it will take as much as eight minutes to complete the process,” he said. “Do we have eight minutes?” Wyn asked as Jamie looked at her wristlet. “You’re welcome,” Wyn answered, though she felt the emptiness as they swam or ran, or whatever they did, and were gone. K9 finally moved back from the computer and retracted his nose probe, announcing that the dam was now fully open and locked off. “But time is running backwards still,” Wyn observed. She looked out of the windows and saw the Parisian sky flickering as the days ran by, days, nights, fine weather, rain, snow, too fast to determine a single day or year. Just like the voices of the people it was an amalgam sky, made up of nearly three thousands years of skies. “But that means there will be another moment when there IS no tower,” Wyn answered. Wyn thought about what it had been like hanging there in mid air, over three hundred feet above the ground, the foundations of the tower a mere gaping hole below. It was horrible even when they were safe in stasis. This time they would start to fall after ten seconds. Even if the tower started to rebuild itself it would only meet their falling bodies. They would impact with the steel in painful and fatal ways. If they missed the tower and landed on the partly built platform above the legs, their brains would be shook out of their cracked skulls, bodies pulped, every bone broken. K9 would be pieces of mangled scrap metal among the organic material. “Jamie!” Wyn called to her in a voice that felt small. “I.…” She wrapped her arms around her lover and held on tight. “I am not satisfied with this terminal situation either, mistresses,” said K9 mournfully - if a robot dog could DO mournful. “I wish The Doctor was here,” Wyn said as she felt the floor beneath her feet dissolve and she hung in the air for the ten seconds that Jamie’s stasis field could maintain. “To HELL with The Doctor!” screamed Jamie as they fell. K9’s hover mode slowed him a little, but gravity had caught him as inexorably as it had his flesh and blood friends. It pulled Wyn and Jamie apart as they tried to cling to each other. Wyn screamed as she felt her fingers yanked away from Jamie’s hand. It flipped her over so that she could see just where she was falling. The foundations of the tower were a brown smudge below. She tried not to think of being a red smudge on top of it as the scream that came uncontrollably from her mouth mingled in her ears with the sound of the air rushing by. Then there was no rushing air and her scream died away. She was no longer looking at a brown smudge on the grown far below. She was looking at a green mesh floor half a foot from her face. “To HELL with The Doctor?” queried a familiar voice. “Well, if you’d rather take your chances I can always….” She heard Jamie reply hurriedly. She managed to turn her head far enough to see K9 hovering directly over her. The Doctor pushed him away so that he would not land on her then caught hold of Jamie’s foot as she hovered like a balloon over the command chair. He pulled her down until he could hold her around the waist then called out to Stella to hit the lever. Stella did so and Wyn fell the last foot with an undignified ‘oof’ even though she had time to put out her hands and protect herself from the worst of it. K9 dropped like a stone and sat very disturbingly still. The Doctor took Jamie’s weight as she dropped and the two of them landed on the floor in what might be called a compromising position. Jamie shimmered from female to male and female again as she planted a kiss on The Doctor’s lips. “What were you doing falling through the air above the site of the future Eiffel Tower?” Stella asked as The Doctor transferred his attention to K9 and declared that he had burnt out his hover motor and his long life battery was dangerously low. Wyn and Jamie between them told the story. The Doctor was very interested in the Zerites. “Just you keep on remembering that,” he answered with a soft laugh. “Ok, first things first.” He dematerialised the TARDIS and moved it forward in some three thousand years in time and a few yards of space. 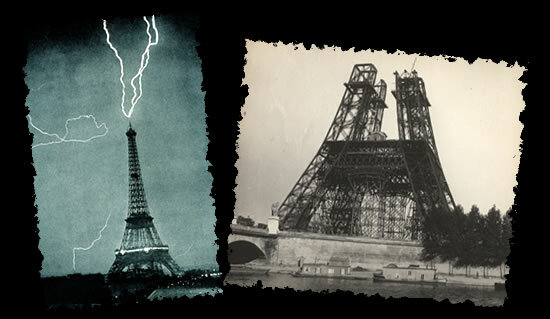 He rematerialised it in mid-air beside the fully intact and temporally stable Eiffel Tower. It was as bad as she feared. Lieutenant Friel’s door was closed but Wyn and Stella waiting outside and every Time Agent at their desks heard him as he berated Jamie for acting without orders, for committing sabotage, treason and several other offences before telling her she was not only fired but would be arrested and facing a number of criminal charges. “I’ve been talking to the commander about that,” The Doctor said. “The dams are not the problem in themselves, although I do think they’re a very dubious way of preserving history. The problem is using them non-stop. A water dam is released every so often. 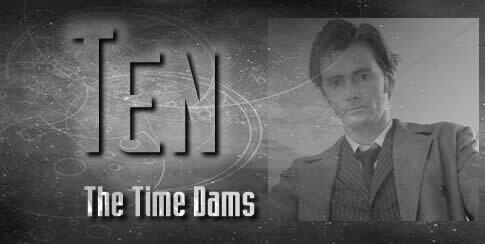 So can the time dams. They will be switched off for three or four hours every night. The monuments won’t be harmed and the Zerites will be free. “I knew you’d know what to do,” Wyn told The Doctor. “Wyn thinks you can do anything, Doctor,” Jamie observed. Jamie blushed and that turned to the chief commissioner. “Start tomorrow after you hand in your report,” said the Commissioner.